Tibetan Spikenard Incense Sticks are traditionally hand-rolled from natural herbs, oils and other ingredients. Its gentle, earthy aroma calms the nerves, uplifts the mood and clears the mind, resulting in emotional and spiritual clarity. Tibetan Spikenard (Pang Poe) Incense Sticks are traditionally hand-rolled from natural herbs, oils and other ingredients. Its gentle, earthy aroma calms the nerves, uplifts the mood and clears the mind, resulting in emotional and spiritual clarity. The herbal ingredients are also valued for their medicinal and sedative properties, and can help with insomnia and other ailments. 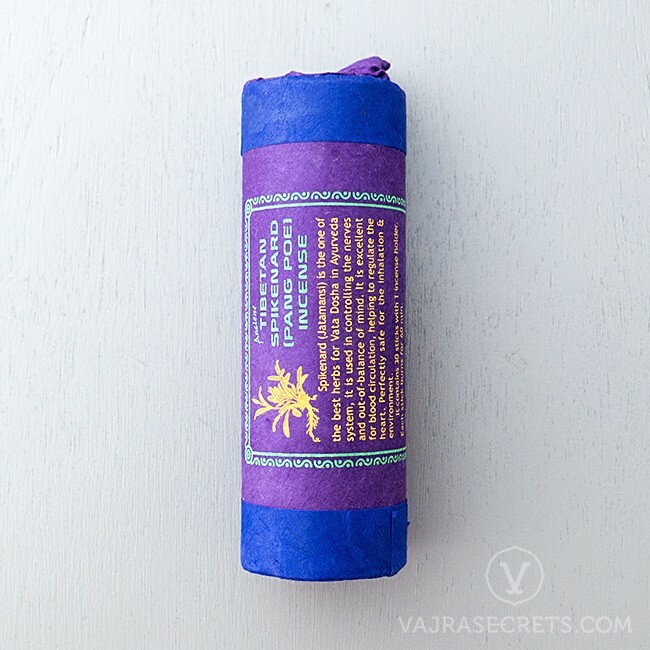 It is excellent for cleansing and purifying the environment of unwanted energies and to aid relaxation and stress-relief. It is also particularly used during spiritual ceremonies and meditation sessions to create a peaceful and calm atmosphere.